Today I made an extra fiery juice with double the amount of ginger I normally use. Ginger is great for supporting a healthy immune system and really helps to detoxify your body. To balance out the ginger, I added an extra lemon (two in total), along with some other favorites like carrots, celery, spinach, beets and apples. It tastes so fresh & clean! I've started making two servings of juice per time, so I can keep some for the next day. Fun fact: you can store fresh juice for up to 3 days as long as you include lemon, which acts as a natural preservative. This is so amazing! I love when you post about healthy juice recipes or any recipe. Please kepp them coming Annie. This is inspiring! 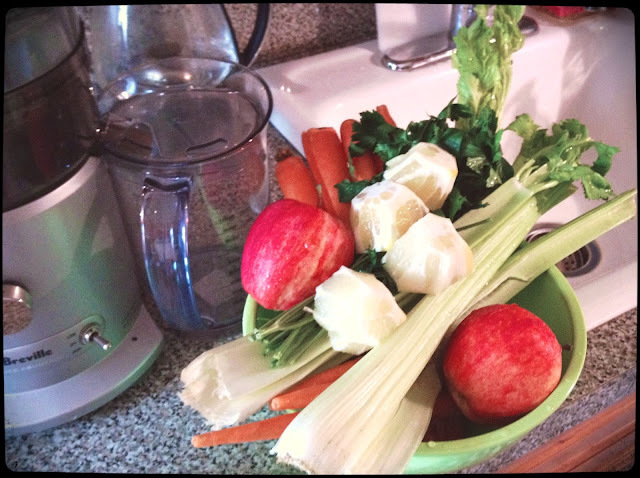 I've been getting into juicing lately, and so far I really love it! It's so quick and easy and delicious. I feel great after my juice. Thanks for your awesome post, this just gave me a new recipe to try. Have a lovely day! i LOVE ginger! nice job incorporating it. we can all learn from you. Hey Annie - besides following a good and healthy diet, I started working out at the gym. And that's because you inspired me and give me so much good motivation and energy! It would be awesome if you could film a video on how you are training at the gym and which part of your diet is important concerning sport/exercise.